Gum disease specialists, Drs. Richard Amato and Michael Kang raise awareness of minimally invasive gum surgery alternatives available using modern advancements in dentistry. This periodontal team welcomes new and existing patients in and around the Waterbury, CT area to experience LANAP® laser gum surgery. Drs. Richard Amato and Michael Kang raise awareness of modern gum surgery alternatives with less invasive techniques, less discomfort and less recovery time. 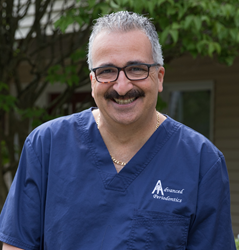 Serving patients in an around Monroe and Waterbury, CT with gum disease symptoms like receding, swollen and bleeding gums, and bad breath, this team is reaching out to the over 64 million Americans who currently have this life-threatening condition with a minimally invasive solution. What many do not realize is that painful gum surgery is not the only way to restore their oral health; Drs. Amato and Kang use gentle and effective laser dentistry. When bacteria builds up on the teeth and gums it can lead to irritation of the gums and deep periodontal pockets. If left untreated, this infection can cause bone loss, receding gums, tooth loss and even some systemic health conditions like high blood pressure, heart disease and stroke. In many cases, after scaling and root planing and periodontal maintenance treatment have proven ineffective, many periodontists recommend osseous gum surgery. A traditional and effective form of gum disease treatment, osseous surgery uses scalpels to remove gum tissue and access hard-to-reach areas of infection below the gumline. After treatment is completed, sutures are used to close the treatment site. In this modern age of dentistry, Drs. Amato and Kang strive to always offer the latest, convenient and most effective treatments possible to their patients. The revolutionary LANAP® laser gum disease treatment uses the PerioLase® MVP-7™ dental laser to target and remove gum disease-causing bacteria without cutting or sutures. In many cases, LANAP completely eliminates the need for osseous surgery altogether. After treatment is completed, LANAP seals the treatment site to avoid infection and is the first FDA-cleared laser therapy to inspire true bone and tissue regeneration, encouraging a faster recovery to proper oral health. With proven positive results and a shortened healing time, Drs. Amato and Kang, as well as their patients, frequently prefer this gum surgery alternative. By replacing scalpels and other painful dental tools with a precise dental laser, patients remark that the procedure is more gentle and offers minimal discomfort during the procedure as well as during recovery. Specialists in periodontal treatments, Drs. Amato and Kang welcome new patients with gum disease in Waterbury, Trumbull, Shelton, Danbury and Newtown areas to their state-of-the-art periodontal practice in Monroe, CT. For a gum disease consultation or to learn more about this minimally invasive gum surgery alternative, call Advanced Periodontics and Dental Implant Center of Connecticut at 203-268-2000 or visit http://www.connecticutperiodontist.com.